So, it says on my about page that I am a writer. This is true. I have taken joy in in putting pen to pad or fingers to keys for many, many years. Admittedly, I wasn’t always good at it, but writing is a skill and as with any skill, you have to work at your craft to get better. One “How to write” book told me that writers have to be hunter-gatherers, always on the lookout for inspiration. Carry a note book to write down interesting details that can be used later. Today I slept in. This annoys me as there was no good reason for it, but it is what it is. Today was always destined to be a study day, improving my craft at proofreading and beginning work on creative writing workshops and maybe if I could squeeze it in, some novel plan. My body betrayed me and kept me asleep until much later than intended. This image really sums up what today is about, and probably many other days yet to come. 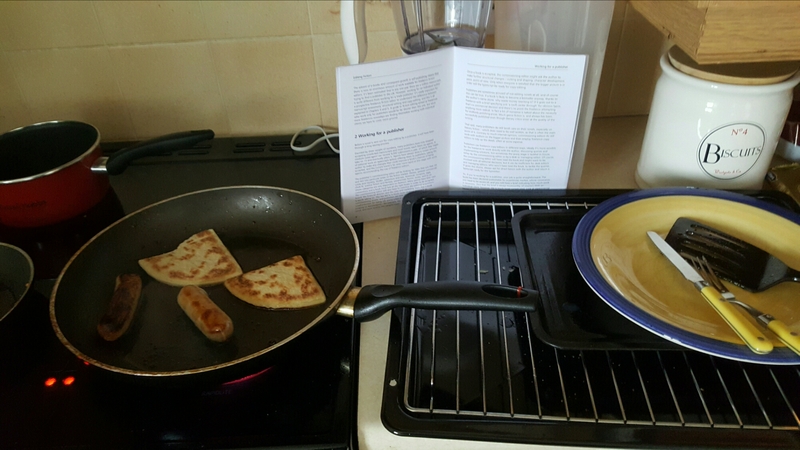 Cooking a fry up when I should be on cereal, whilst reading and learning. Or, from another point of view, trying not to burn my kitchen down whilst balancing. A study guide during cooking. No kitchens were harmed in the production of this post.